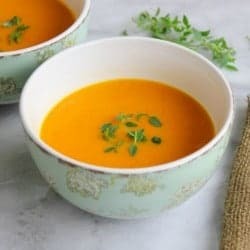 This is my favorite recipe for butternut squash soup! I tastes velvety and creamy without any added cream or dairy. We have been making this recipe for a few years now. 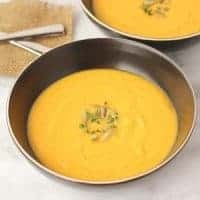 I haven’t bothered to try any other butternut squash soup recipes since discovering this one because it is so good! Paired with freshly cooked quinoa and a salad, it makes for a simple and nourishing meal my whole family loves. My toddler loved this when he was a baby and still enjoys it! 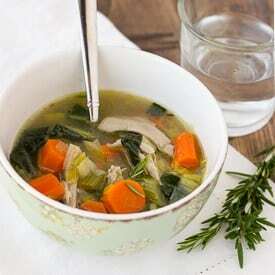 This soup is also a breeze to prepare. The whole thing will only take about 30 minutes from start to finish! You chop up the butternut squash and give it a kick start steaming in the microwave while you cook the leeks. Then the soup only needs an additional 15 minutes or so to simmer before you blend it up. The past two years, we have kind of started a tradition of making butternut squash soup on Halloween before trick-or-treating. You can’t beat a healthy, warming soup with that seasonal orange color! Place the peeled, seeded, and cut butternut squash chunks in a large glass bowl. Cover with plastic wrap and microwave for 15 minutes. Meanwhile, heat the butter or oil over medium heat. Add the leek and cook until softened, about 5 minutes. Reserve the liquid from the butternut squash stemming. Add the squash to the pan with the leek and cook until a brown fond forms (be careful not to burn it!) on the bottom of the pan, about 10 minutes, stirring occasionally. Add the stock and and scrape the bottom to get all the brown bits off (that is all the flavor!) Add the thyme, bay leaves, and cayenne and bring to a simmer. Simmer until the leeks are fully tender, about 10 minutes. Remove the bay leaves and thyme and blend the soup in a high-speed blender or using an immersion blender. Add water, 1/2 cup at a time, to thin the soup to to the consistency you like. Just made this, it’s quite good. I added the juice of one tangerine and used sage & rosemary (because Farm Fresh to You sent them) instead of thyme. Oh and since I’m Latino I used more than a mere pinch of the good stuff!! I imagine swirling in some plain Greek yogurt would further elevate things. Thank you for posting this and putting my delivered leeks to good use. Thank you for the recipe! I have made it a few times with some variations. My favorite is to add a chopped apple (I steam it along with the squash in Step 1). Cheers! When do you add the 1-2 cups of water? Yes butter is dairy! Many people with dairy sensitives can tolerate moderate amounts of butter (it’s mostly fat and has very little lactose/casein). However, you can definitely use coconut oil in it’s place like the recipe indicates. Making use of my butternut squash, leek & thyme received earlier this week from Farm Fresh to You. First time making a squash soup. 10 minutes to go — smells heavenly! Absolutely delicious!! I didn’t add any additional liquid as recommended to make it a thinner consistency. It was perfectly creamy as is after running it through the blender. Will definitely make again. Prep took much longer than than 15 minutes suggested as I’d never prepped a butternut squash before – the skin is tough! !